WARNING: This product can expose you to chemicals including Nickel (Metallic), which is known to the State of California to cause cancer, and 1,3-Butadiene, which is known to cause birth defects or other reproductive harm. For more information go to www.P65Warnings.ca.gov. A great way to allow precision control and variability in your professional recordings is to isolate the microphones between a musician’s voice and instrument from one another; Sterling’s compact, light (UMS) is an excellent choice for just this task. When using two microphones in proximity like this without proper separation, troublesome issues like cancellation and phasing can occur, leaving the recording thin and unnatural. The UMS will ensure excellent proximity separation between these mics. Sterling’s Utility Microphone Shield does an excellent job of keeping unwanted vocal reflections to an absolute minimum. When you’re recording any podcast or YouTube speaking performance, you want to have the most discreet isolation from other room surfaces to ensure the highest clarity and annunciation transfer. 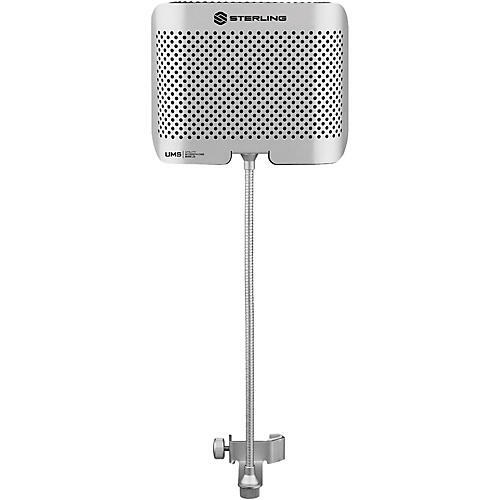 The Utility Microphone Shield’s extremely versatile lightweight aluminum design includes a flexible gooseneck that easily clamps to most microphone stands. This allows you to hook it up in almost any angle or configuration to accommodate the complexities of drum microphone placement. Keeping the hi-hat isolated from the snare drum gives you a perfect, clean mix that’s highly controllable; for a robust, full recording you can always add distant reflections with room ambient mics as well. Unwanted acoustic reflections come from multiple sources: Intended sound source reflecting off of untreated walls and ceilings back into the microphone pick-up pattern; unintended sound source bleeding into the microphone.